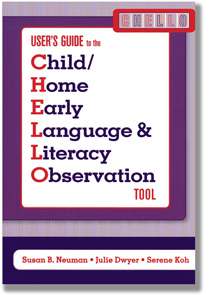 Child/Home Early Language and Literacy Observation (CHELLO) is the only observation tool specifically designed to rate the early literacy environment in home-based child care settings. 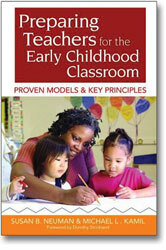 A reliable, field-tested tool derived from the bestselling, classroom-focused Early Language and Literacy Classroom Observation (ELLCO), CHELLO has been carefully tailored to assess environments. Administrators, program directors, and researchers can use CHELLO to develop accurate profiles of materials and practices in family/group child care settings, help providers improve their literacy supports and their interactions with children, and measure changes in the quality of environments over time. Age focus: 0-5. Softbound, 104 pgs.